As a summary of my latest post, I was explaining there are several digital communication systems to send orders to trains (DCC, Selectrix, Motorola,...). All them are based in a Central Station that, with the help of a Booster, modules the electric current to send commands to the mobile decoders installed inside the locomotives. But DCC is by far the most common and widely used at least in N gauge, despite it isn't the best nor the most versatile. Later we saw, because of the lacks of functionality of DCC, new feedback buses used to send back information to the Central Station from the Feedback Modules. An example of those buses are RailCom and S88, but nowadays they are completely old-fashioned. And before talking about the different elements that compose a digital layout, I think is mandatory to talk about the Control Buses. The election of the Control Bus is the key for a new installation. It acts as a backbone or central nerve system interconnecting all components together. That means, all components must be compatible with the Control Bus. So it's a restrictive selection and it will restrict us in the range of digital components that we can connect to the layout. Everybody jumps into digital world buying first of all the Central Station, but most people select it taking into account just visual characteristics like how many throttles it has, or if it has color screen, or tactile, ... when all this things (throttles and panel screens) are not really part of a Central Station. Also functions like the possibility of creating routes or move trains in an automatic way are evaluated, when again those functionalities shouldn't be in charge of the Central Station. The better approach for me would be to evaluate the compatibility with the different buses in the market, and therefore with the existing software and electronic components like feedback modules, output modules, servo management modules, sound modules, ... of course other characteristics like how many locomotives can drive at the same time or the current power should be also evaluated. But before that, what is a Bus? Taking the definition from wikipedia: "a bus (from the Latin omnibus, meaning 'for all') is a communication system that transfers data between components inside a computer, or between computers. This expression covers all related hardware components (wire, optical fiber, etc.) 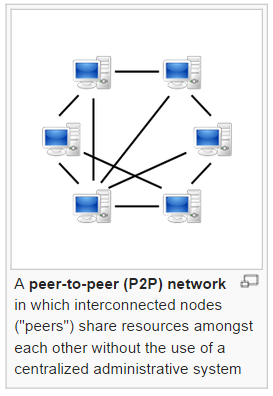 and software, including communication protocols." It means a Bus specifications covers and explains not only the physical medium used (cable, radio, WiFi, fiber optics, ...), type of connectors (USB, microUSB, SubD9, RJ12, ...), supported topologies..., but also the communication protocol, message formats, type of commands available and everything referred to the software and programming part. There are dozens of distinct Bus in the market, and many manufacturers designed its own bus like an industrial secret, without sharing the specifications so only they can build peripherals and modules and become your only possible supplier, setting the prices they want. Of course these are the ones we have to avoid first. Second, there are also other kind of Bus being created openly by groups of users, completely the opposite example than before. But in many cases all the hardware must be constructed by our own so you need a deep knowledge of soldering, isolating boards, electronics and programming. Usually it's a cheap but very complicated solution. 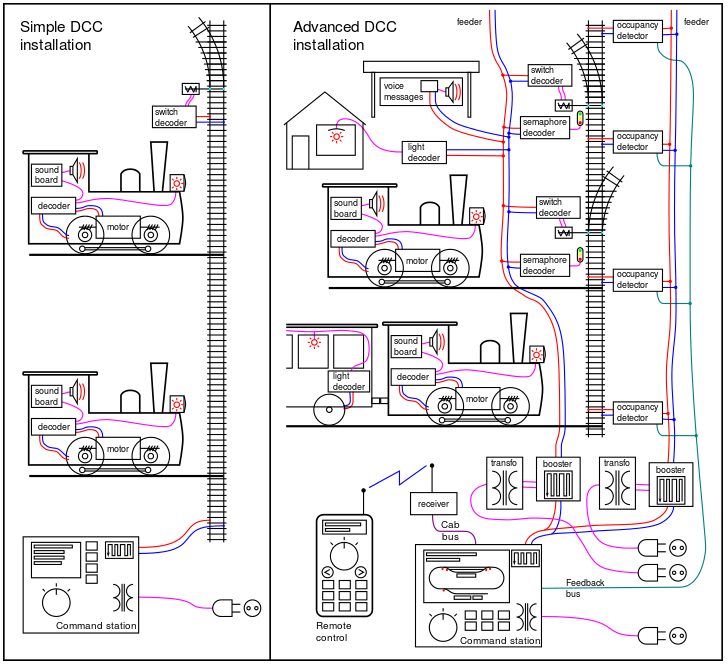 So despite the communications with locomotives will be for sure DCC, the connection and dialog with the rest of components of the layour (PC, outputs, feedback modules, sound, lighting, ...) will be done through the Bus. That's why is so important the bus election over the central station, throttle or any other component. 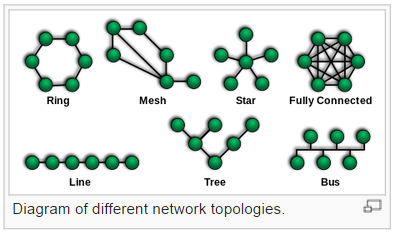 Very flexible form the topology side, it can be connected very simple in line, or using hubs and combine star and tree. The Bus is property of one manufacturer (Digitrax), but on the other hand specifications are public. Everybody can access to them and build and program they own modules and devices. Supporte by multiple manufacturers. You are not restricted to Digitrax, also Uhlenbrok, Digikeyjs, Fleischmann, ...) make central stations, modules, throttles and all kind of devices for Loconet. DIY (Do-it-yourself) possible. If you like to program, and/or build and/or solder your own electronics, there's plenty of information to make your own digital system's components and shops to buy pre-made boards. Arduino compatible. For me that's a personal must. It exists a Loconet shield called GCA185 that you can build or buy here, done by Giling Computer Applications. With this you can easily program your own throttles, fast clocks, outputs/input modules, sound modules, .... whatever!!!! I don't want to state Loconet is the best option, just my recommendation knowing no details about the final user. That's the option I have despite if I would start again from scratch, may be I would choose C-BUS because I like to construct all my electronics. But as I want this to be usefull, from now on I will talk just about DCC and Loconet combined, which seems the best option at least in a short/medium term.